Terrain: Pavement, tracks, grass and rocky paths. Steep in places with some overgrown sections – covered legs are recommended! Starting point: Beesands car park (TQ7 2EL). For more information, see our Beesands Beach guide. Dog-friendly: Yes, including both beaches. 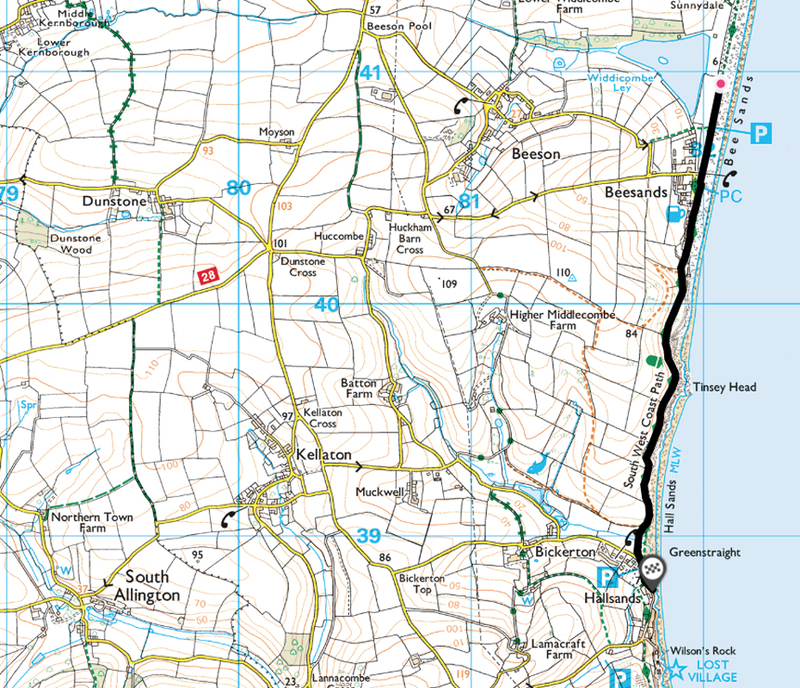 To view the OS map for our Beesands to Hallsands walk, please click here. Start Bay is a beautiful and historic 15-mile section of coastline, stretching between just south of Dartmouth down to Start Point. 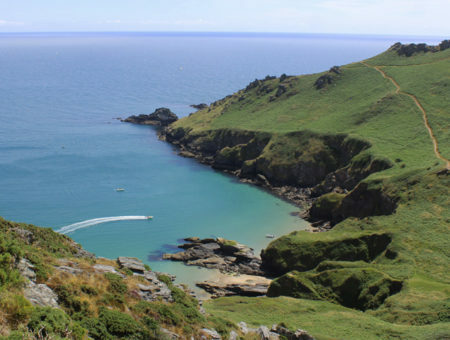 This circular walk provides outstanding views of some of the bay’s most breathtaking sights. 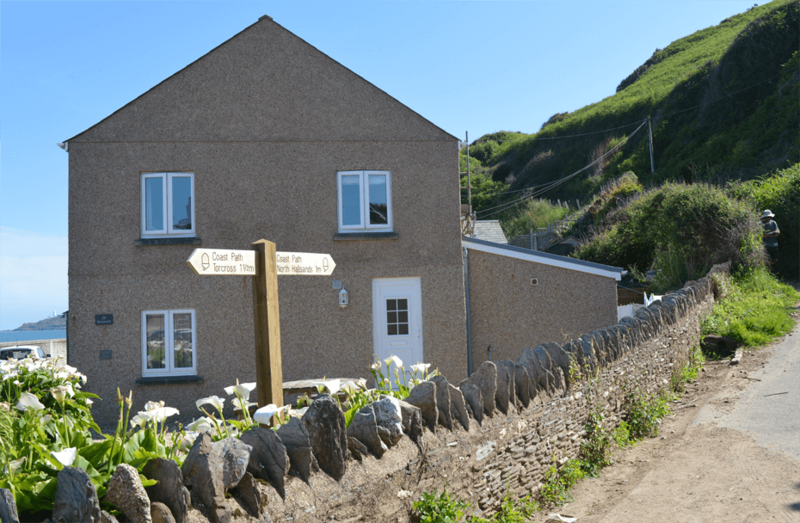 These include elevated views of the picturesque villages of Beesands and Hallsands, the ruins of South Hallsands and, in the distance, the iconic Start Point lighthouse. Park at Beesands (free) and, with the sea in front of you. Where the promenade comes to an end, follow the track right, leading up the hill. As the track leads uphill, look behind you to enjoy an elevated view of Beesands. You’ll have another chance to see it on the way back, but it’s a sight we never tire of! Stick to the lower track en route to Hallsands. Keep an eye out for ever-improving views of the Start Point Lighthouse as you head south. Go through the gate. Keep a close eye on your dog as this field is often occupied by cows. Hallsands will come into view. Head down to the beach, keeping to the edge of the field. Cross the beach, walk along the row of houses and climb the steps. Follow the path left at the end. Did you know that two stunning holiday apartments in Prospect House are available with Coast & Country Cottages? Perched high over the ruins of South Hallsands, these self-catering properties provide breathtaking coastal views, use of an outdoor heated swimming pool and luxurious accommodation throughout. Find out more about our Prospect House properties. Take a quick detour left, following the signs to the viewing platform. Learn more about South Hallsands as you look over the ruins, across to Start Point and out to sea. Head back to the main path and turn left. Follow the track downhill. Pass the tennis courts. You’ll come to a car park on your left. On your right, look for a stile. Cross it to enter the field. Follow the path – the line to your left is electrified so keep your dog under close control! Keep to the right of the field. You’ll come to a gate. Go through it and brace for yourself for an often-overgrown section of the walk! You’ll come to a road. Turn right, heading downhill towards Bickerton. Bear right onto Bridgeway Lane. Be prepared for another overgrown path! Turn left when you come to a road. Shortly afterwards you’ll see a stream to your right and a Public Footpath sign. Cross the stream onto the path. Follow the red waymarker through Higher Middlecombe Farm. Go through the gate. Turn right at the road. Shortly afterwards, turn right again, going through the gate. Follow the track to the left of the field. Keep left, following the sign for Beesands. In the left corner of the field, you’ll come to a gate, which is easily missed beneath the undergrowth. Simply follow the trail back to Beesands. As you’ll be returning along a higher path than that which took you to Hallsands, you’ll find the views are even more special! 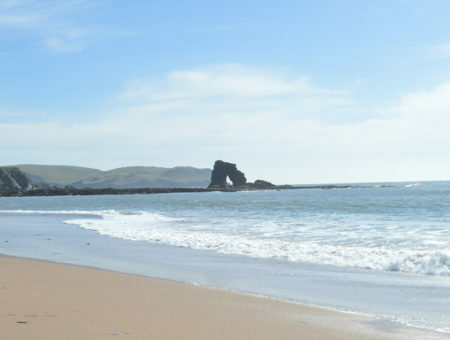 We hope you enjoyed our visual guide to the circular Beesands-Hallsands walking route. How about trying some of these too? South Devon is a walkers’ paradise, so why not take your next break in our Area of Outstanding Natural Beauty? 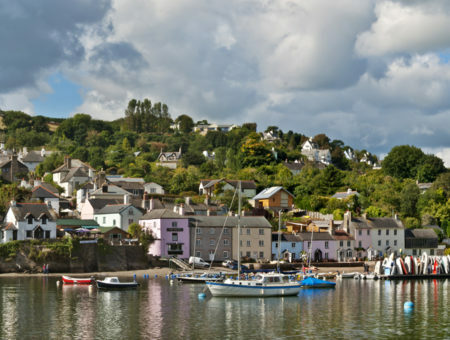 Explore around 400 self-catering holiday homes in South Devon today.